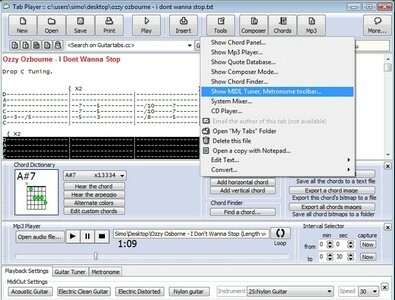 Description: A freeware title that allows you to play any text tab, create and compose tab and includes useful guitar extras. Teaching Ideas: This freeware title is very useful for guitarists and those wanting to learn alternative notation for guitar. It has a built in guitar chord dictionary (very useful for learning chords on the guitar), a metronome, and guitar tuner. It also searches any of the online guitar tab databases for existing songs and can play them back. Literally, you can find any text tab on the net and cut and paste it into this program and it will play it back for you. You can also compose and hear your own tunes by using this amazing freeware title. You can also register this title and receive a number of extra benefits, nonetheless it is a very good freeware title.